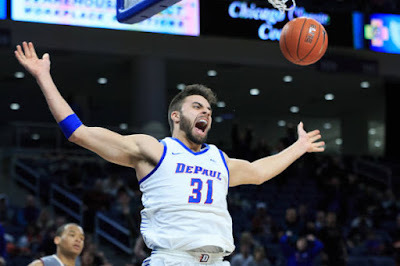 The DePaul Blue Demons (10-5, 2-2 Big East) have entered unchartered territory as they have won back-to-back conference games for the fourth time since reconfiguration in the 2013-14 season and look to make three wins in a row as the Butler Bulldogs (10-7, 1-3 Big East) visit Wintrust Arena on Wednesday night. Here are my five things to watch for in the Butler/DePaul matchup. With Marin Maric graduating in the off-season, the Blue Demons needed a replacement in the frontcourt and have gotten it with Femi Olujobi. Olujobi put together his most complete performance of the season with a 27-point, eight-rebound outing in a 79-71 win at then-No. 24 St. John’s on Jan. 12. Another similar outing on Wednesday could propel DePaul to its tenth home win of the season— the most since 2006-07. Max Strus’ game continues to excel in his second season for the Blue Demons with team-highs in points per game (18.4) and rebounds per game (7.6). The senior will be motivated to put together another a strong showing similar after being held to seven points on 1-of-5 shooting in the last meeting at Butler on Feb. 3, 2018. In the win over St. John’s, Strus showcased more of a physical presence with 12 rebounds, to go along with 14 points. Since joining the Big East in the 2013-14 season, the Butler Bulldogs have had a stranglehold in the series with the Blue Demons winning nine of the ten meetings. In the last meeting at Hinkle Fieldhouse, Butler demolished DePaul, 80-57 as Kelan Martin highlighted four Bulldog players in double figures with 26 points. DePaul forward Paul Reed continues to excel in his sophomore campaign with 9.5 points per game and 7.3 rebounds per game. Reed produced his first-ever double-double with 18 points and 10 rebounds at St. John’s and will be one of the keys to slowing down Butler center Joey Brunk. In a season of transition for Butler basketball, Joey Brunk has provided some much-needed stability in the frontcourt for the Bulldogs in league play. Despite a 1-3 mark in the Big East, Brunk produced his first career double-double against Seton Hall on Jan. 9 with 20 points and 10 rebounds. Brunk’s play combined with Kamar Baldwin’s team-high 17.0 PPG could pose as a credible inside-outside threat to snap a rare two-game losing streak in Big East play.